With Cast 11" 3-Spline Stake. lines are the same as plain markers. 4 LETTER OR DIGITS PER QUADRANT. WITH 8' INTEGRALLY CAST GALVANIZED SPIKE. Lettered: PERPETUAL CARE, ANNUAL CARE, ENDOWED CARE, RESERVED, RESERVED CARE, or CARE at no extra charge. 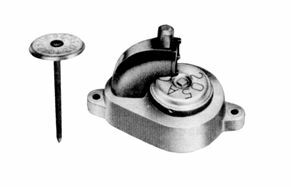 C241/318 4" OVAL Upright type, designed for high grass areas. 24" X 1/4" aluminum rod furnished. C241/320 4" x 7" All aluminum with 11" spline stake. These lot markers are virtually indestructible and maintenance free. 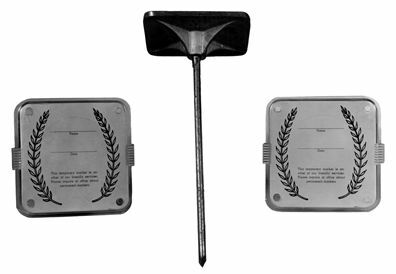 they are made with cast iron anchor pins topped with a stainless steel disk, which you can number yourself with the HAND NUMBERING MACHINE. Markers include disks and pins and are available in two sizes. For use where upright markers are not permitted. Inscription enclosed in water-proof, transparent envelope and protected by heavy acrylic panes. When set, it rests one inch above ground. 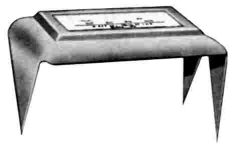 CARD OPENING: 2-3/8" x 4-5/8"
4" SQUARE TOP, FLUSH TYPE, WITH 8" STEEL SPIKE. COMPLETE WITH THE PLASTIC TOP AND STANDARD PRINTED PAPER CARD. 4" SQUARE TOP, UPRIGHT TYPE WITH 24" x 1/4" ALUMINUM ROD. COMPLETE WITH PLASTIC TOP AND PRINTED PAPER CARD. WEATHERPROOF. CHANGEABLE CARDS PRINTED WITH VITAL INFORMATION. RECOMMENDED AND USED BY MOST CEMETERIES. Available in five colors: Grey (1), Walnut Brown (2), Green (3), Orchid (4) or Black (5). Bristol Board name cards are included at no charge. Heavy Gauge clear acrylic panes for marker windows come with Crown, Royal and Surface Markers. SOLD IN LOTS OF 25 ONLY. Card Opening: 2-1/4" x 4 -3/4". for easy reading. Height overall: 16-5/8". Card opening: 2-1/4" x 4-3/4"
Height overall: 16-3/4". Card opening: 2-3/8" x 4-5/8"
Classic regal Lines. Stake is tilted for easier reading. Height overall: 16-5/8". With each order: Emblems, nameplates and box of assorted letters and numbers (choice of emblems). Nameplates imprinted with your firm's name. All markers are highest quality baked on enamel. they are made from hot dipped galvanized steel - rust resistance for long lasting use. 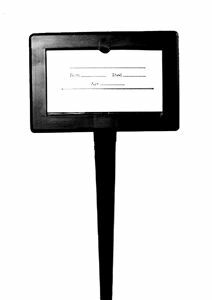 Easy to put together - just fill out card and snap in place. With each order: Marker imprinted with your firm's name, box of assorted high impact letters and numbers. Five emblems to choose from.. Fill in information on aluminum insert with ball point pen or pencil. Imprinted with your firm's name. letters, numbers and letter holders.